OAK RIDGE, Tenn. June 25, 2018 – The US Department of Energy’s Oak Ridge National Laboratory is once again officially home to the fastest supercomputer in the world, according to the TOP500 List, a semiannual ranking of the world’s fastest computing systems. 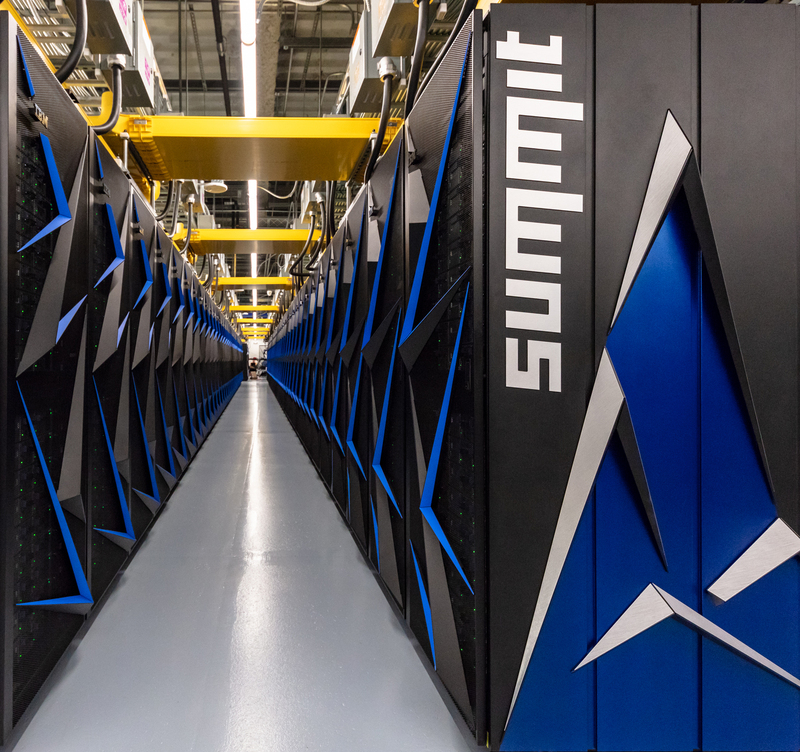 The recently launched Summit supercomputer was announced as No. 1 today at ISC High Performance in Frankfurt, Germany. The designation recognizes the IBM-built system as the science community’s most powerful computational tool for solving problems in energy, advanced materials, artificial intelligence, and other domains. Summit is the third ORNL system to be ranked No. 1 by TOP500, following in the footsteps of the Jaguar and Titan supercomputers. Jaguar ranked as the world’s fastest system in November 2009 and June 2010, while Titan held the title in November 2012. The IBM Summit system reached a speed of 122.3 petaflops on the High-Performance Linpack benchmark test—the software used to evaluate and rank supercomputers on the TOP500 list. At its theoretical peak, Summit is capable of 200 petaflops, or 200,000 trillion calculations per second—about eight times more performance than its predecessor Titan. 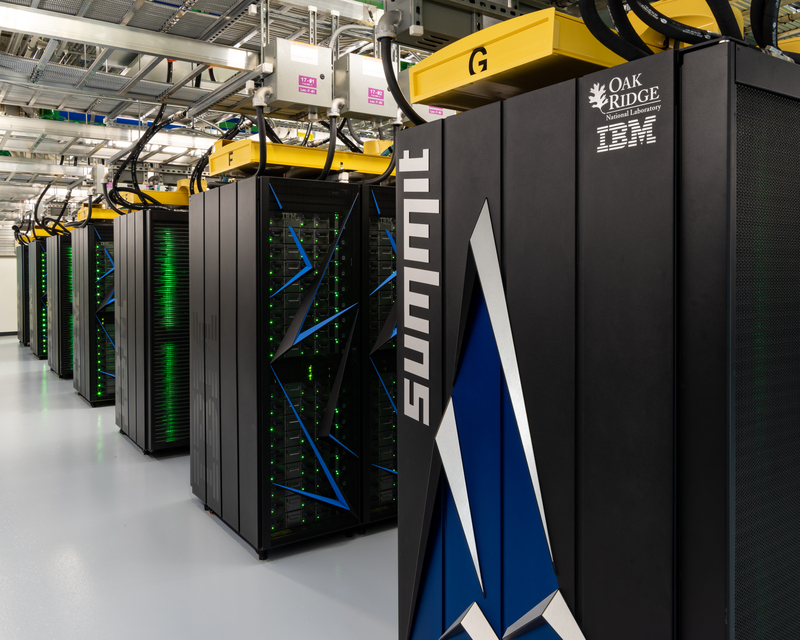 Summit consists of 4,608 compute servers, each containing two 22-core IBM Power9 processors and six NVIDIA Tesla V100 graphics processing unit accelerators. Summit is interconnected with a dual-rail Mellanox EDR InfiniBand network, which provides overall 200 gigabits per second throughput to each compute server, and runs a standard Linux operating system from Red Hat in Red Hat Enterprise Linux. The system also possesses more than 10 petabytes of memory paired with high-bandwidth pathways for efficient data movement. The combination of cutting-edge hardware and robust data subsystems marks an evolution of the hybrid CPU–GPU architecture successfully pioneered by Titan and a substantial step toward the goal of delivering the first US exascale supercomputer—a system capable of a billion billion double precision floating point operations per second. In advance of Summit’s launch, scientists began using portions of the system to test and demonstrate its significant capabilities. The IBM system is planned to be made available to the research community through DOE’s user programs beginning with allocations made under the Innovative and Novel Computational Impact on Theory and Experiment (INCITE) user program that will start in January 2019. Potential uses for the world’s most powerful machine include applications in health care analytics for the nation’s veterans. Salman Habib of Argonne National Laboratory, whose team is modeling the large-scale structure and distribution of matter over the 13-billion-year lifespan of the universe. Dmytro Bykov of Oak Ridge National Laboratory, whose team aims to describe the electronic structure of large molecular systems using quantum chemistry techniques, with targeted applications that include pharmacology and nanotechnology. Abhishek Singharoy of Arizona State University, whose team is investigating the mechanics of a biological motor called ATP synthase in all-atom detail, a study which may aid the design of bioinspired clean energy technology. Gaute Hagen of Oak Ridge National Laboratory, whose team is calculating the forces within atomic nuclei to study phenomena such as neutrinoless double-beta decay, a hypothesized form of radioactive decay. Caption: Oak Ridge National Laboratory’s Summit supercomputer was named No. 1 on the TOP500 List, a semiannual ranking of the world’s fastest computing systems. Credit: Carlos Jones/Oak Ridge National Laboratory, U.S. Dept. of Energy.